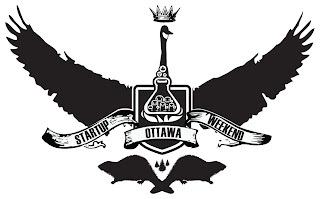 Chances are, if you follow my Twitter stream, you already know that I'm sending my weekend hanging out at Startup Weekend Ottawa. It's my third time hanging out at this event, and my second time as a mentor. And it's way too much fun to put into pixels. Last night, 50+ people showed up to nervously mingle and get the courage up to stand in front of the room to pitch their ideas. The session kicked off with a welcome from the organizers, as well as an overview of the global nature of SWO from Cheryl Draper, SWO alum and now global Startup Weekend Facilitator. Cheryl informed the group that we're not alone at this; there are 12 simultaneous events going on all over the world this weekend. And those events will provide attendees in Ottawa the opportunity to reach out to other people around the world to do field research and testing on their prototypes. The group heard from two former SWO teams, VidRack and TattooHero, who offered advice on how to get through the weekend and most importantly, set expectations in the room for the weekend: this is not about creating a startup in 54 hours, it's about finding your "MVP" - most viable product - that can turn into a business after the weekend. Prototyping and working through the business idea are critical to SWO success. Once the intro was over, and the group had an opportunity to ease some nervous tension with a group primal scream ;) 22 people took to the front of the room to pitch their ideas. Ideas ranged from ride sharing (3 ideas!) to solar mining DIY kits to hospital wait time apps to art marketplaces (2 ideas!) to MAC OS virtualization for developers. I find that last one intruiguing, considering the number of devs I know who use Windows emulators on Macs; a Mac emulator on Windows for iOS and MAC OS development is something I thought would have already existed. I'm looking forward to seeing if the idea got selected and finding more about it today. Once the pitches were done, the group voted on the best ideas and formed teams around them. They spent the rest of the first night brainstorming ideas so they could go back this morning and get to work. Today, I'm headed back to help out as a mentor. My job is to ask a lot of questions and act as a sounding board as they work through ideation and prototype development. I can't wait to see what the teams are working on. You don't have to be there to provide your input into the ideas being worked on. Secondly, watch the event hashtag (#swo5) for shoutouts from the teams. Starting today, teams will be issuing requests to the Twittersphere. They'll be looking for people to answer questions, fill out polls, test prototypes, etc. If you want to be a global participant, just keep an eye out for these types of messages on the hashtag and provide your input!